The Avengers – one of the leading in the Marvel brands of comics with kids today. 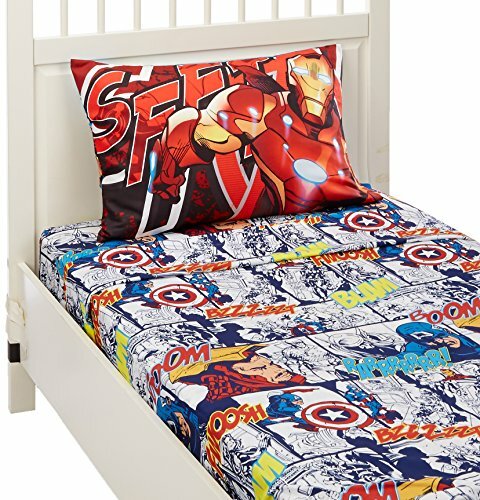 These superheroes are perfect for enhancing your child’s imagination and inspiring to conquer everyday challenges, so why not bring that positive energy into their bedroom? 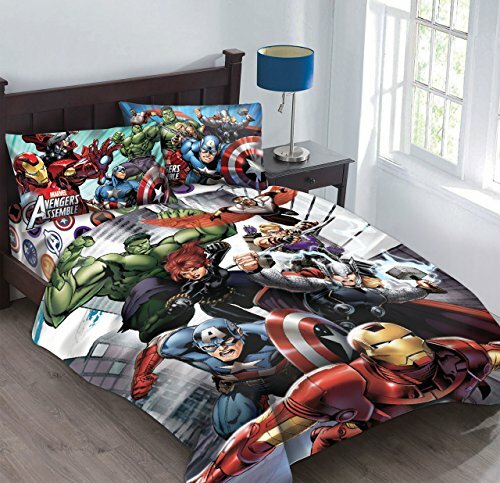 If you are looking just for Incredible Hulk bedding items, we have those too! 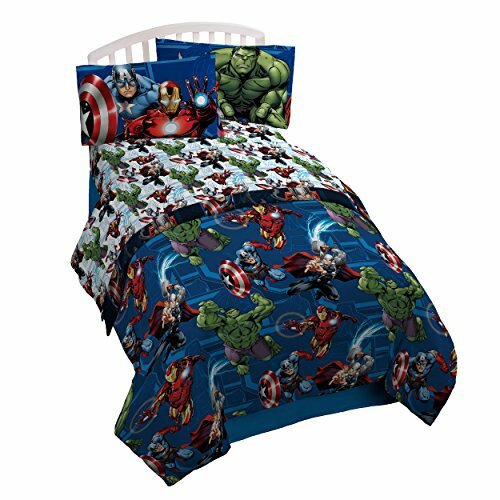 Below are some of the best selling Avenger Bedding Sets we could find! Some include everything you need to have a complete bedding set, others are pieces that you can put together to create your own unique look! 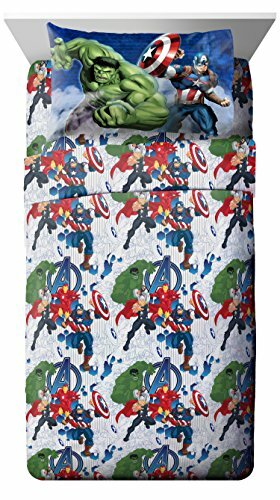 Measures: Fitted sheet 39" x 75", flat sheet 66" x 96", (1) standard pillow case 20" x 30"
Flat Sheet: 66" x 96", Fitted Sheet: 39" x 75" and Pillowcase: 20" x 30"
Marvel Avengers 'Publish' Full Reversible Comforter, 76" x 86"
Avengers bedding sets and items are typically very bold in color – which makes sense giving their bold attitudes! 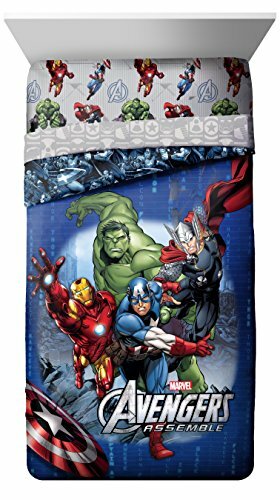 If you get the full Avengers bedding set with the sheets and comforter then we suggest more simplistic accent pieces like a simple blue lamp and carpet if you have hardwood floors. Curtains in a contrasting color like red or green can help give a more fun and playful look while keeping the room from being overwhelming. If you are only getting a sheet set and pillowcases, then you can get a more simple cover or throw in a single color so that the sheets become the focal point. Then you can add in more Avengers art by including the Avengers panel curtains. 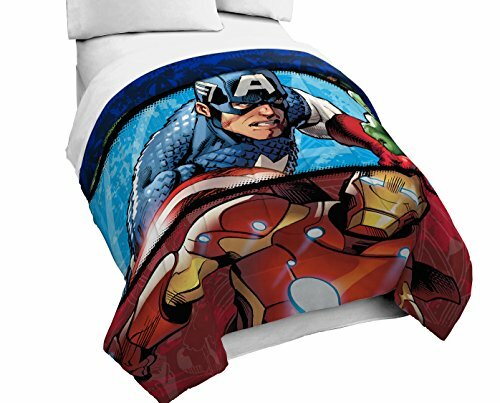 If you do these curtains with an Avengers comforter and sheets then it may be overwhelming, so we highly recommend 1 or 2 Avengers pieces with a touch of solid colors that match the decor to have a well designed room that is not too busy.